Mr Walker said: “It was a pleasure to meet representatives from as far afield as China and Rwanda. However, the highlight of the evening was the ‘Address to the Haggis’, given with great panache by Woodmill High School sixth-former, Miss Esther Garrow. Word and pitch perfect, Esther entertained the company with aplomb, including a daring knife display in which she despatched the haggis! The international guests certainly enjoyed her contribution. “Esther is a serial award winner of Burns competitions, and the Presiding Officer chose well in inviting her to perform the opening recitation at this prestigious Burns Supper. Such a talent is to be nourished in Scotland. Everyone wishes Esther well in maintaining her talent in future years. 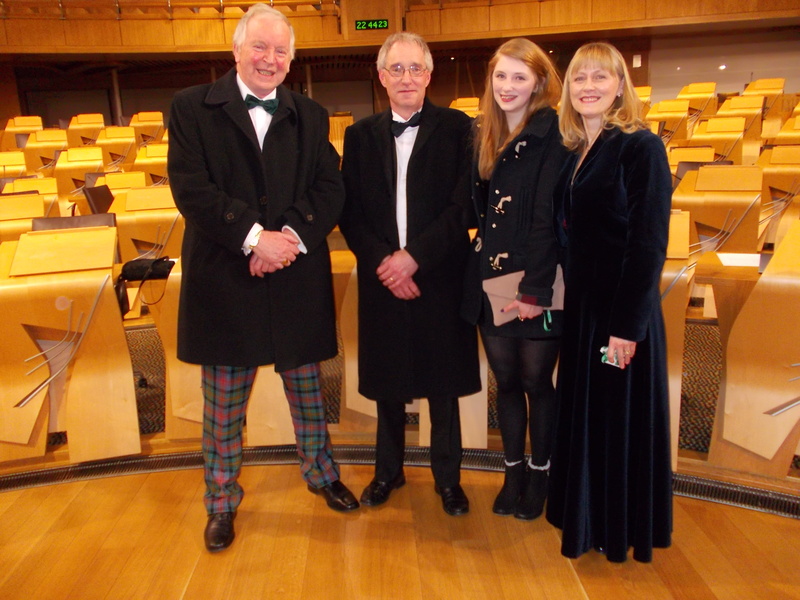 “After the Supper, Esther and her parents, Linda and John, visited the floor of Parliament’s Debating Chamber with Colin Keir, MSP for Edinburgh Western, and myself. Linda mentioned afterwards how she will now be able to relate better to what she hears and sees from Parliament on the radio and TV.